(Office of Her Majesty, Press Department - Amman) Jordanian youth from around the Kingdom got a chance to participate in the World’s premier economic gathering when they joined Her Majesty Queen Rania Al-Abdullah at a session tackling challenges facing youth in the Middle East. At Monday’s World Economic Forum (WEF) session titled ‘Saving Youth’, participants from different parts of the Kingdom - representing the Princess Basma Youth Resource Center, Jordan Junior Achievement Program (INJAZ), and the Jordan Youth Forum - got the Jordanian youth’s voice heard across from the lowest spot on Earth to the globe. Rubbing shoulders with ambassadors, ministers, CEOs, well-known journalists and editors from Jordan and abroad, the youth engaged in lively discussions on education, empowerment of youth, political participation, gender equality, and private-public sector partnership. During the session, attended by WEF President Klaus Schwab and UNICEF Executive Director Carol Bellamy, Queen Rania noted that the youth captured the essence of His Majesty King Abdullah’s vision and are, therefore, the ones who will bring about positive change. She added that while the youth need to be proactive, it was the society’s role to instil self-confidence in them and help them have their voice heard. ‘’Youth are the vanguard for reform and are the engines for change,’’ Queen Rania said, adding that through her interaction with the youth and their active engagement in dialogue on several occasions, this session should be called ‘youth saving us’. Mr. Schwab announced WEF’s commitment to the Forum of New Global Leaders, a new initiative that will bring together 1,111 young leaders and engage them in WEF activities with the aim to have an impact on the regional and global affairs. 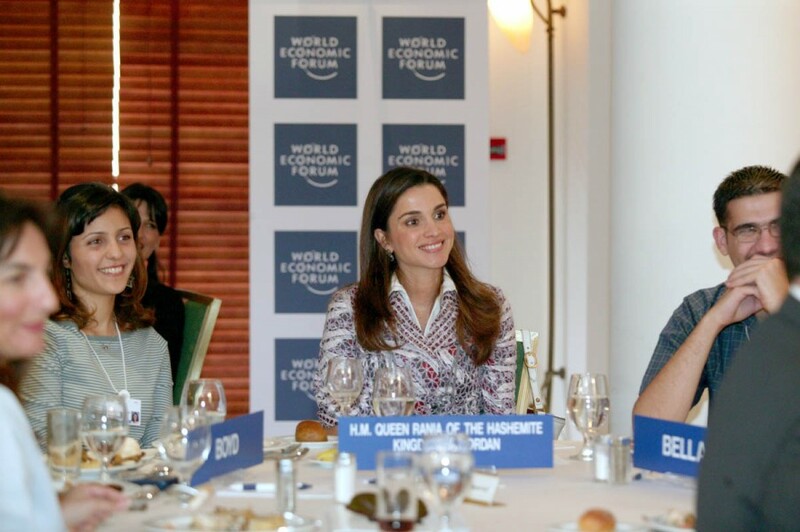 As a WEF board member, Queen Rania called on WEF to take action to include the voice of youth into strategic discussions and place them center stage next year, adding that the Forum of New Global Leaders, WEF’s newest initiative, should include a mentoring program so that new leaders can be identified and nurtured. As the youth joined participants at each table, discussion focused on the importance of education in providing equal opportunities for all – a basic tool that enables them to hone their skills and compete locally and internationally. Queen Rania noted that reforming education and updating curricula to meet the needs of everyday lives does not involve curriculum change and introduction of IT only, but also creating quality teachers to serve as role models. The discussion also touched upon creating opportunities for the youth, a system of meritocracy, integrating leadership programs in school curricula in order to reach the biggest number possible, the role of youth in shaping events in society, including taking an active role in political development though lobbying by able politicians and deputies. But what do officials plan to do after hearing the youth’s challenges and aspirations, one student asked as the session concluded. In summing up discussion of the roundtables, Ms. Bellamy said the Jordanian leadership’s engagement with the youth should be a model for the world. “It’s a two-way street. Leaders and youth can benefit from one another,” she added. On the sidelines of the sessions at the Dead Sea, Queen Rania met UNICEF Executive Director Carol Bellamy and Jordan Country Representative Anne Skatvedt during which they discussed youth issues and opportunities created through UNICEF initiatives.